A slab of cool air slides into and under a warmer air mass. This "drainage inversion" can occur when there are sea breezes, cold fronts or when cool air drains downhill into warmer air. Warm air flows over cool surfaces and lower layers cool more rapidly than those above. Shading from trees as well as from rolling terrain can cause an inversion to set in earlier and stay later. Around sunset, the ground cools rapidly by radiating heat upwards into space. The air in contact with the ground cools by conduction, causing the lowest layer of air to be cooler than higher layers. Air within this "radiation inversion" tends to remains in place. There is continuous overcast, low and heavy cloud. Wind speed remains above 7 m/h for the whole period between sunset and sunrise - although even this isn't always true. smoke or dust hangs in the air and/or moves laterally in a sheet. If you suspect there's an inversion, then don't spray. Often, it's right on the label. It’s that time of year again when hot weather fuels the creation of ground-level ozone, also called smog. 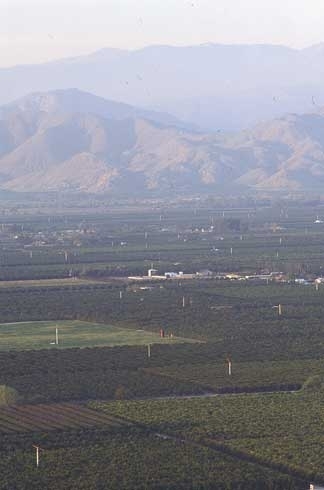 High levels of ozone can harm people and crops. Ozone is caused by mixing volatile organic compounds (VOCs), nitrogen oxide, and sunshine. Some pesticides emit VOCs that contribute to ozone formation. Regulations may require reduced application rates, specific injection depths, soil compaction requirements, and a tarpaulin repair response plan. Fumigants used in greenhouses and for certain nursery fumigations, potting soil, individual tree and vine replantings, or harvested commodities are not affected. Pesticides that contain solvents typically release high rates of VOCs. Solid formulations release the least amount. Starting in 2014 a PCA recommendation is required for use during May 1 to October 31. If the VOC emissions level is exceeded, applications for high-VOC formulations may be prohibited. Whether in a NAA or not, simple steps can minimize the release of VOCs into the air. Use other pest management tactics. 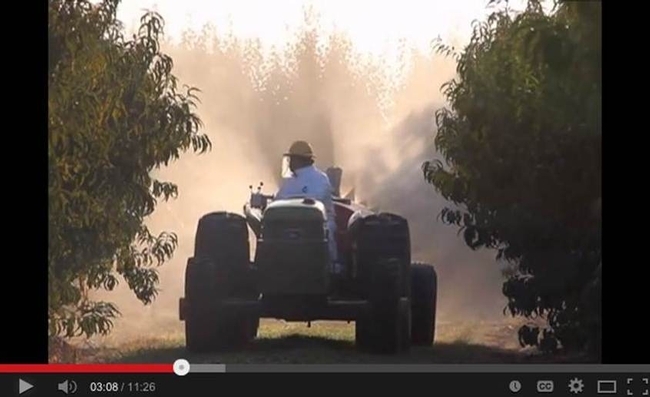 Choose low-emission pesticides or formulations. Use DPR’s VOC calculators to determine emissions. Consider reducing the amount of pesticide applied by spot treating, making fewer applications, or using target-sensing equipment. Choose low-emission application methods for fumigants. Fumigate and cover with tarpaulins. Fumigate and cover with several post-fumigation water treatments. If possible, apply pesticides before May or after October. Follow laws and regulations, especially in NAAs where additional regulations may be in effect. 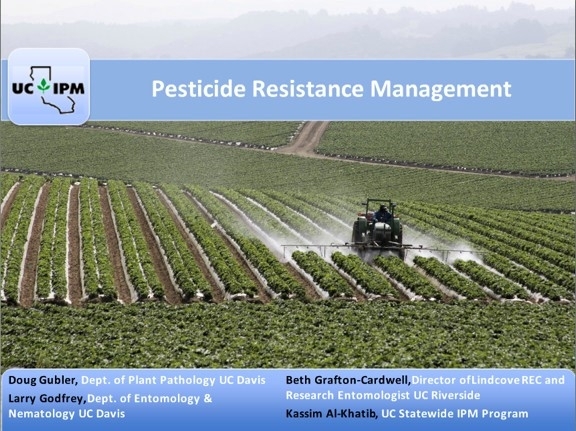 When choosing a pesticide using the UC Pest Management Guidelines, click on the Air Quality button at the top of each treatment table. It will take you to the Department of Pesticide Regulation’s VOC calculators to determine emissions from fumigant and nonfumigant pesticides. Written by: Franz Niederholzer, UC Farm Advisor, Sutter/Yuba Counties and Rhonda Smith, UC Farm Advisor, Sonoma Co. Agricultural spray adjuvants are materials added to the spray tank when loading the sprayer. They include products classified as activator adjuvants and marketed as wetters/spreaders, stickers, humectants, and/or penetrators. Activator adjuvants are marketed to improve the performance of pesticides and foliar fertilizers. Activator adjuvants can have a place in tree (and vine) crop sprays, but matching the material to the job can be tricky. A bad match can lead to minor or major losses to the grower. Minor losses can result from excess spreading and pesticide runoff from the target plant. Phytotoxicity can cause major damage. This article describes ingredients and functions of activator adjuvants commonly sprayed on tree and vine crops. Suggestions regarding activator adjuvant selection are offered. Growers must make their own activator adjuvant use decisions based on experience, particular needs, and risk tolerance. Do I need to add an activator adjuvant? Read and follow the specific instructions on the label. If the pesticide or foliar fertilizer label indicates the product should be used with certain types or brand of adjuvant(s), that’s what you need to use. Do I want to add an activator adjuvant? If the label includes phrases such as "use of an adjuvant may improve results" or “complete coverage is needed for best results” then you may want to look into selecting and using an appropriate activator adjuvant. Before proceeding with use of an activator adjuvant, first look at your existing spray program. Are you already doing the best spray job you can? Good spray coverage begins with proper sprayer calibration and set up. Is your sprayer calibration dialed in for different stages of canopy development? Optimum sprayer set up – gallons of spray per acre, ground speed, fan output, and nozzle selection/arrangement-- changes from dormant to bloom to early growing season to preharvest sprays. Adjusting your sprayer to best match orchard and vineyard conditions at each general stage in canopy development is the foundation of an effective, efficient spray program. An activator adjuvant will not make up forexcessive tractor speed, poor nozzle arrangement and/or worn nozzles. Your money is best spent first dialing in your sprayer(s) for the whole season, before considering an extra material in the tank (that is not required on the label). If you have your sprayer(s) dialed in for each orchard and stage of growth, now is the time to say “OK, I want to think about a little extra boost to my spray job”. Which activator adjuvant properties do I want? First, know the properties of the pesticide you will use. Does it work on the plant surface or inside the plant? This is a key point in selecting adjuvants. Here is a quick review of the main classifications and characteristics of activator adjuvants as they currently appear in the field. Note: Certain products can provide more than one adjuvant property – that can be beneficial in the field. For example, non-ionic surfactants can work as surfactants and penetrators, depending on use rate. Wetters/spreaders: These materials contain surfactants that decrease the contact angle and increase the spreading of the spray droplet on the target. High rates of wetters/spreaders may also increase penetration of pesticide into the target tissue (leaves or fruit), potentially causing phytotoxicity. 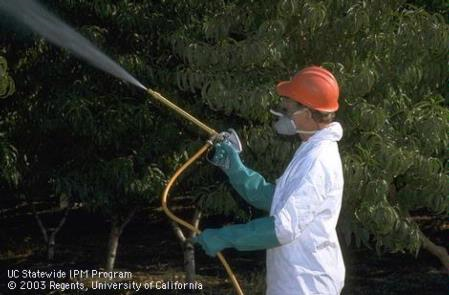 Excessive spreading of pesticide spray solution and runoff from the target may result when using a new or higher rate of spreader -- especially when using silicon “super-spreaders”. Test new combinations of spreader material(s) and spray volume before regular use. Spray volume per acre or adjuvant use rate will probably have to be reduced if a labeled rate of adjuvant provides excessive spreading. Compare the results of your adjuvant test with a similar application of your current pesticide/adjuvant combination on another portion of the row. If there is no pooling or runoff with the new adjuvant in the tank, you can use the adjuvant with confidence. A lack of pooling or run off with the new adjuvant also might mean that your old sprayer setup and tank mix didn’t deliver adequate coverage. If the test with the new adjuvant showed pooling on leaves and/or runoff on the ground, you have several choices. You can reduce spray volume per acre by replacing some or all nozzles with smaller nozzle sizes on the sprayer in an effort to reduce overspreading. If you saw overspreading on some portions of the canopy, but not others, reduce nozzle size only on the part of the spray boom that targets the over-sprayed part of the canopy. Recheck spray coverage if nozzling changes were made. Reduce the adjuvant rate and recheck coverage/spreading. You can just go back to your established program without the new adjuvant. What’s the “best” course of action? That depends on your farming operation.Reducing spray volume per acre means more ground covered per full spray tank – a potential time and cost savings. If spraying is done during the heat of the day in hot, dry climate, spray water evaporation is a major issue and it may be best to keep the higher spray volume and reduce the spreader rate or eliminate it entirely. Checking coverage and overspreading allows you to make the best decision possible; avoid damage and, hopefully, save money. All farming operations are different. Make the choice that best fits your farm. Stickers: These adjuvants can increase the retention time of the pesticide on the leaf and reduce rain wash off. They may limit movement of systemic pesticides into the plant, and are probably most beneficial when used with protectant materials (cover sprays). Do you overhead irrigate? Is there rain on the horizon? If you answer yes to either one of these questions, you may benefit from using a sticker. Humectants: Under low humidity conditions humectants can help reduce spray droplet evaporation before and after deposition on the plant. This is especially valuable when small droplets and/or materials that must be absorbed into the plant (systemic pesticides, PGRs, nutrients, etc.) are used in the summer under high temperature and low relative humidity conditions. 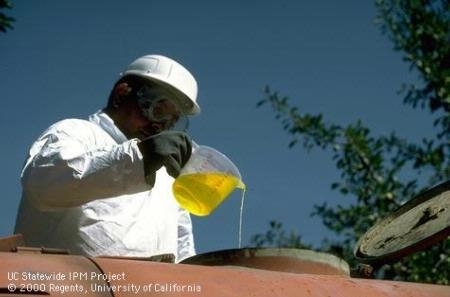 Penetrators: Frequently used with herbicides, these products include oils (petroleum, vegetable, or modified vegetable oils) and non-ionic surfactants used at higher rates. In crop sprays, penetrators can be used to increase absorption of systemic pesticides (for example, oil with Agri-Mek) as well as translaminar materials. Penetrator adjuvants should be used with caution oravoided entirely with surface active pesticides such as cover sprays or else phyto may result. 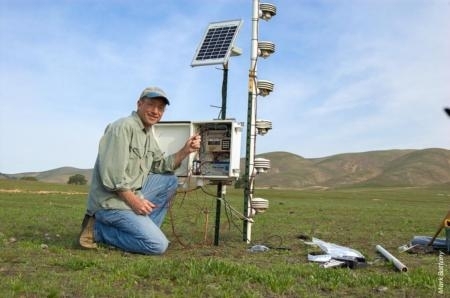 Finally, some penetrators can increase the rain-fastness of some pesticides. Which adjuvant material should I select? Will the adjuvant I selected work in the spray I’m planning? If you choose to use an adjuvant that is not specifically listed on the pesticide or foliar fertilizer label, jar test the planned spray solution first. Use the same spray water source. Include all leaf feeds, other adjuvants, and pesticide(s) that you plan to put in the spray tank. Do this before tank mixing these materials. 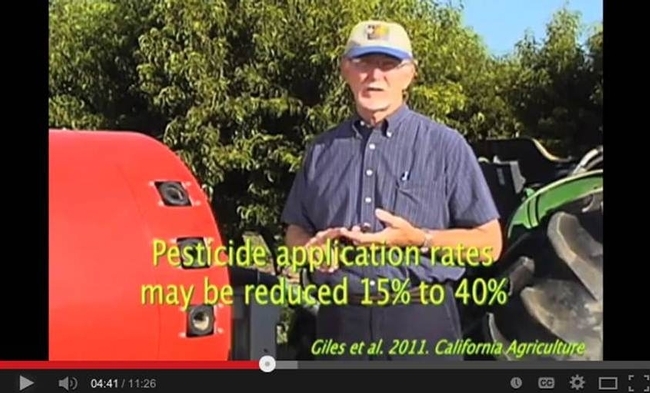 A lot of time and money rides on effective pesticide application. Do your homework before the spray tank is filled and you will be well on your way to solid results. 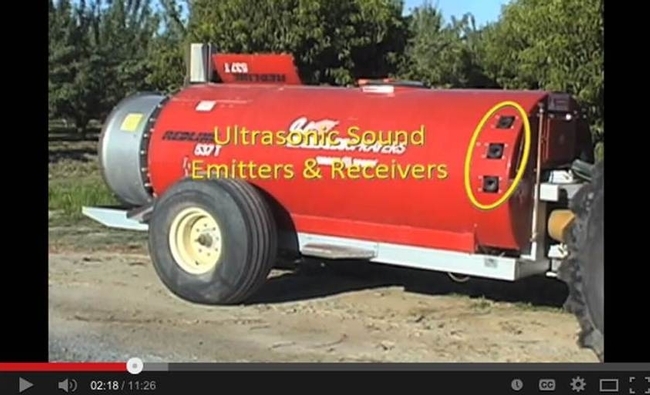 Agricultural spray adjuvants are materials added to the spray tank when loading the sprayer. Photo by Jack Kelly Clark.